When NUMA team leader Kurt Austin finds his own memories of a dangerous mission aren't to be trusted, he must follow a trail of mysterious disappearances to the truth in the #1 New York Times–bestselling series. After a narrow escape during a perilous rescue operation to save the passengers and crew from a sinking yacht, Marine adventurer Kurt Austin awakens with fragmented and conflicting memories. Did he see an old friend and her children drown, or was the yacht abandoned when he came aboard? For reasons he cannot explain, Kurt doesn’t trust either version of his recollection. Determined to know the fate of his friend, he begins to search for answers. Soon, he finds himself descending into a shadowy world of state-sponsored cybercrime and uncovering a pattern of vanishing scientists, suspicious accidents, and a web of human trafficking. With the help of fellow NUMA operative Joe Zavala, he takes on the sinister organization at the heart of this web, facing off with its members in locations ranging from Monaco to North Korea to the rugged coasts of Madagascar. But where he will ultimately end up even he could not begin to guess. Good addition to the Austin NUMA files collection. Great pace and lots of action in typical Cussler Teadition. I like when Kurt and Dirk collaborate. 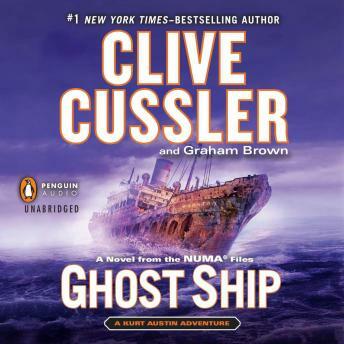 Graham Brown collaboration with Clive Cussler works well I love Scott Brick as a narrator. Great voices and pace puts you in the story. Awesome as usual. As always, Clive delivers a book you just can't quit. A great listen while traveling. Narrator was ok, but sounded kind of bored with it. Worth the listening!